In children's and YA literature, we know that comics and graphic novels are a growth area. We know that there's momentum, too, to provide children and teens with work by Native people and people of color. 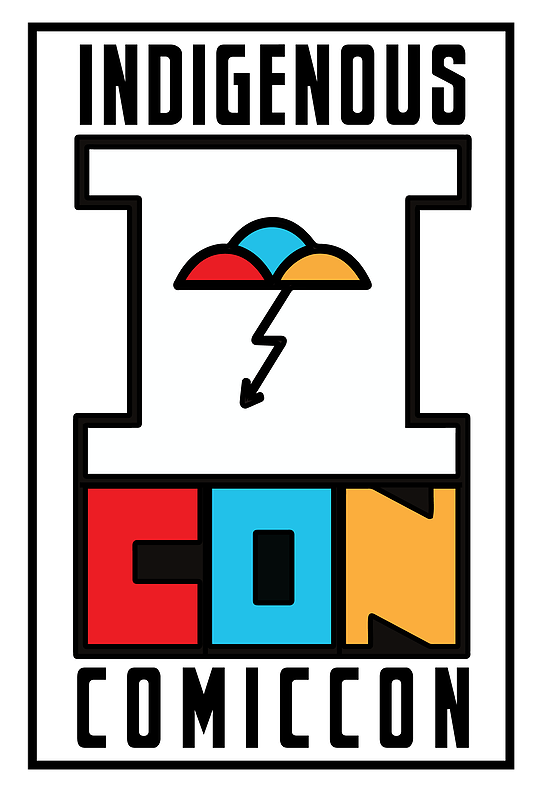 With that in mind, I hope that representatives from large and small publishers will head to Albuquerque in November of this year for Indigenous Comic Con. The list of special guests includes people who are very popular in Native circles. That means their work resonates with Native people, which means their work is legit. People within the industry who pay attention know that we love the 1491s! And, Arigon Starr! They are among the special guests for the conference. Indigenous Comic Con is being organized by Native Realities publishing. People often ask me to recommend a publisher who they can count on for authentic and accurate books about Native peoples. I'm usually hesitant to recommend one because some who publish books that I recommend also publish books that I find problematic. Native Realities is the one exception. So far, I haven't seen anything from them that is problematic. Most (all?) publishers tell us they want diverse voices. With this post, I'm looking at publishers and editors who proclaim their interest in Native voices. Indigenous Comic Con is an opportunity to meet Native writers and bring their work into greater visibility. Register (get your tickets). An early-bird three-day pass is $45. Look at all the things you can do while there! Attend Indigenous Comic Con. Get to know Native people there who are creating terrific comic books, videos, and games. Scholars who study boarding schools for Native children report that there was a wide range of experiences at the schools. Those who write about it take care in what they say about the schools. Today, they touch our lives, through the stories we hear from our elders, or from our own experiences in them, or from what we lost because of them. The American Indian boarding school experience left an indelible mark on the history of the United States and Canada, and only recently have we tried to understand the significance of the schools in the lives of students, teachers, administrators, and Indian communities. Perhaps we have waited so long for this scholarly examination because of the difficulties involved in addressing the dramatic impact of the boarding schools on the lives of so many people. For some American Indian students, the pain they suffered inhibits our intrusion into their lives. For other students, their boarding school days were filled with fond memories, sometimes mixed with melancholy, sometimes with humor. Understanding the many and varied levels of the boarding school experience is a complex business. No single interpretation of this experience exists today or ever will. Native American students and their parents viewed the schools in many different ways. Oral and written accounts by Indian students and non-Indians involved at the schools are extremely diverse. Historian Tsianina Lomawaima recently wrote to the editors that "part of that message, importantly, has been that the schools were not monolithically destructive or successful in their assimilative goals, but the harsh reality is-for some people, they were." A key point in that excerpt is the diversity of experience. Given their long history and existence today, how could it be otherwise? Some were in Canada, some were in the U.S. There were/are "off reservation" boarding schools, and there were/are day schools on reservations, too. When they were in elementary school, my parents went to the day school on their respective reservations. Then they went to Santa Fe Indian School, where they met in the 1950s. Because of the stories they told me and the reading I've done, I know experiences varied widely by time and place. Children in the US are not generally taught about the schools. Because some teachers use children's books to bring history into the classroom, it is crucial that the information conveyed in those books be accurate. As noted above, I cannot recommend Smelcer's Stealing Indians. As my notes show, accuracy is an issue. Another is the lack of specificity of the character's respective nations. As regular readers of AICL know, I think it is important that writers be tribally specific (telling readers a character's tribal nation, within the story or in an Author's Note) because that specificity increases knowledge that can push back on the monolithic or stereotypical imagery that is far too prevalent in today's society. CHAPTER ONE is about the four teenagers and how they were taken from their homes. Lucy Secondchief is 13 years old. She's thinking about her father, who's been dead for four years. Specifically, she's thinking about the day of his burial, when some people brought food to their house, but others came to collect old debts. The latter took two rifles, a stack of lumber, the entire sled dog team, and the sled, too. That night, the sky was filled with the northern lights, which Lucy has been taught to fear because they are "a bad omen" and "a malevolent force that comes down to carry people away" (p. 18). Rather than stay inside she walks into a field. The lights drop down and surround her. People in the village watch in disbelief. Dogs howl and cower. Lucy starts to laugh aloud. Debbie's comments: What is Lucy's tribal affiliation? We aren't told. Because of the northern lights and the sled dog/team, we can assume she's meant to be Alaskan Native, but which one? There are over 200. Amongst them, there are over 20 different languages. And of course, a diversity with regard to how they view the northern lights. Do some think they're a malevolent force? Maybe so, but it isn't likely they all feel that way. Lack of tribal specificity, then, has consequences for additional information we're given. [S]he knew what the document said. Every Indian parent knew what it said. All across the country, Indian families were given the same piece of paper, which proclaimed the end to families. The paper was the law. It was the government's authority to steal Indian children from their families and send them far from their homes and villages. The law was for the sake of the children, a ticket to a better life free from the burdens of poverty and ignorance. The paper was the law that sent them to Kansas, Oregon, the Dakotas, California, Oklahoma, and Pennsylvania--anywhere far enough away so that they would forget what it means to be Indian. The men grab Lucy, drag her to the car, push her into the backseat and close the door. There are no door handles on the inside. The Commissioner of Indian Affairs, under the direction of the Secretary of the Interior, is authorized and directed to select and designate some one of the schools or other institution herein specifically provided for as an “Indian Reform School”, and to make all needful rules and regulations for its conduct, and the placing of Indian youth therein: Provided, That the appropriation for collection and transportation, and so forth, of pupils, and the specific appropriation for such school so selected shall be available for its support and maintenance: Provided further, That the consent of parents, guardians, or next of kin shall not be required to place Indian youth in said school. Many coercive measures were used to get parents to send their children to the schools. It is possible that two men in Alaska were using a paper like that, but it isn't plausible. It is more dramatic to present these removals with that piece of paper, but that isn't accurate, and is information that would have to be unlearned at some point. There's no reason, in my view, to add to the body of misinformation that already exists. Simon Lone Fight is 14 years old. He lives in an "arid desert" (p. 22) of canyons, arroyos, buttes, and mesas. His parents were killed when he was 13. He is passed from "one cramped house of poverty to another" (p. 24). One of those homes is with his grandparents. One day, Simon sees a "black, high-roofed automobile" (p. 25) arriving at their house. Hiding behind the outhouse, Simon watches two white men get out of the car, briefcase in hand, and approach his grandfather. They argue, and then go into the house. Simon, a runner, takes off. That happens three more times that month. One day, his grandparents offer him ice cream if he'll go to town with them and help them sell hay. Instead of going into town, however, they pull off at the train station. Simon thinks they're going to load the hay onto a train. The train arrives, and Simon doesn't hear or see the black car. The two white men grab him. His grandfather watches and tells him "You must go to school. It's the law." He is put on the train. My comments: There's that "law" again. As noted above, I have found no evidence of a law or piece of paper presented to parents. Use of "one cramped house of poverty to another" sounds like an outsider's observations rather than those of Simon or his relatives, and the way Simon was taken doesn't ring true. Noah Boyscout is also 14 years old. He's out hunting in a snowy landscape. Uneasy when he sees something in the distance, "the young Indian" (p. 28) checks to see how many bullets he has. As he heads home he thinks about how, as a "half-breed" he's an outcast and that he feels more at home in the forest with animals than he does with people. His mother isn't Native and doesn't like the stories he tells her of his interactions with animals: a fox lets him pet it, and a baby moose lays its head on his hip and naps, and he speaks raven and grouse. The thing he saw in the distance turns out to be one of several wolves who are pursuing him. He is afraid of them, ponders shooting them, but figures out that they're really after the dead rabbits he has in his pack. He throws the rabbits at them and makes his way on home to their cabin where there's a "tall black car" (p. 33) in the driveway. When he goes inside, a man in a black business suit and hat greets him. His mother starts crying and runs to the bedroom. There are photographs and papers on the table. The man tells Noah he has to go away, to a school for Indian boys and girls. The story jumps to the next character, Elijah. My comments: I think the snowy landscape and Noah's parka and snowshoes place him in Alaska, but as with Lucy, we aren't given a specific tribe. The use of "the young Indian" tells us he's Native but I find that phrase jarring. It objectifies him and sounds more like an outsider's description than an insider voice. There's that tall black car again and reference to papers, one of which I assume is that "law" that Lucy's and Simon's parents are talking about. The story immediately moves to the next character. Johnny was there to say goodbye. He wasn't going. The government had already taken two of his older brothers and a sister. He was allowed to stay. Not all Indian children were taken from their homes. That would have been unnecessary and, practically speaking, impossible. Neither the available room nor the funding would allow it. The government's goal could be achieved by taking only some, similar to the way the government didn't draft every young man from large families into military service during the war against the Nazis and the Japanese, over for only a few years. Johnny waves goodbye, his father shuffles off, and "The young Indian" (p. 40) got on the train. My comments: Again, we don't know what Elijah's tribal nation is, but the mention of the white buffalo suggests he's Lakota. That part about his nose bleeding sounds more like a horror movie than anything else. Elijah, in Christian stories, was a prophet. It strikes me as odd that this boy's family would name this infant--who they believe will be a "shaman"--by the name of a prophet whose holy water causes that nosebleed. And that part about Johnny being able to stay strikes me as an inconsistency. Remember--according to this "law," everyone has to go. Here, now, we have a different scenario. Does that "law" delineate exceptions for a 4th child in any given family? CHAPTER TWO is about the four teens and their experiences on their way to Wellington (fictitious name of the boarding school). Lucy. After many hours on a narrow, winding highway, the car Lucy is in arrives at a diner where she has french fries, and then a few hours later they arrive at a bus station where she is given a bus ticket. She rubs the red welts on her wrists, but we don't know why those welts are there. She's told that the bus driver will know where she has to get off. She has nothing other than the clothes she is wearing (no jacket). In the morning when she re-boards the bus after a stop, there's a new rider on the bus: Noah. My comments: In the "Questions for Discussion" at the end of the book, item #4 is about a pair of handcuffs at the museum at Haskell Indian Nations University. I assume the author meant to include a passage about Lucy being handcuffed, hence the red welts, but it isn't there. Noah. Noah invites Lucy to sit with him. He offers her an apple. The bus travels hundreds of miles, south. They tell each other about their families. Late that day the driver tells them they have to get on another bus. They can sit and wait for it, but "the Indians" (p. 46) are tired of sitting and walk around the town. A pack of mongrel dogs come out of an abandoned warehouse and run at them. Lucy is afraid but Noah kneels, holds out a hand, and speaks to them. They drop to their bellies and let Noah pet them. After awhile he stands, points to the warehouse, and tells them to go home. The dogs go off, behind the building. "The two young Indians" (p. 47) return to the station, board their next bus and ride all night and much of the next day. Simon. On the train, Simon heads northeast, knowing it will take two days to get to the town named on his ticket. With no food, he's hungry but "The Indian" (p. 49) goes to the dining car and grabs leftover food from empty tables. The next morning he sees "an Indian boy" (p. 50) has gotten on the train, too. It is Elijah, who leans toward Simon and asks his name. Elijah. Elijah and Simon start to talk and learn they're going to the same place. Neither remembers the name of the school but talk about the photographs they saw of the iron arched gateway. Simon learns that Elijah had been on the train for a day and a half longer than he had and he's hungry because he's eaten up all the food his dad had given him. Together they go to the dining car, grab some leftovers, eat and that night, play card games. The next morning the train stops in a large city where they learn they will change trains. They have time before the next train arrives so the two set off to look around. Elijah ("the amazed Indian" p. 53) imagines people who work in the offices. Looking at the people milling about reminds him of salmon. Noah's powers are handy but I view them as stereotypical in the one-with-nature-and-animals way that Native peoples are often depicted. But, my guess is that most of the American reading public will think "cool" when they read how he handles those dogs. As you see, I'm noting some of the places where "the Indian" or "the Indians" is used. I think it distances the reader from the characters. Imagine those passages if the author just replaced all of them with "the kid" or "the kids." Recall that Elijah saw a white buffalo, and so I thought he was, perhaps, Lakota. But now he's talking about salmon and being on the train longer than Simon, which suggests he's of one of the tribes on the northwest coast. Which is it? Is Elijah of a Plains tribe? Or a northwest coast tribe? "The Indians" (p. 53) walk for blocks. "The amazed Indian" (Elijah) imagines all the people in the glassy office buildings they pass by. As they go, people hand them change (money), which they accept, thinking the city people are the friendliest ones in the world. They buy hot dogs and then go down some stairs to an underground train where they encounter four older boys who start to bully them. The oldest asks them if they're Mexicans and if they have any pesos. Elijah says "We're Indian!" One of the boys tries to grab Elijah's backpack. Elijah sees a vague image beside one of the boys. It is a man, holding an empty bottle in one hand and a belt in the other. Elijah tells that boy that he's going to end up like his dad, who drank too much and beat him. The boy is shaken by what Elijah says. Elijah and Simon fight the four boys. Afterwords, Elijah and Simon head back to the station and the chapter ends. My comments: I can imagine these two boys being struck by what they see in a city, but the way their unfamiliarity is described seems a kind of mockery of their lack of familiarity with a city. And--again, the objectification of them is jarring. I provided a close read of chapters one and two, where we meet the characters. There are flaws in the ways these characters are depicted which has bearing on the story. Once they arrive at the school, the four will meet other students. One talks about his journey. It struck me as odd (p. 62): "I was in the bottom of a ship for two days. It was dark and they didn't let us out, neither. It was like we was cows or something. They just herded us in and closed the door." Where, I wonder, did that ship originate?! On page 69 Elijah sees "English Only" posters on the wall. To my knowledge, there weren't posters like that in the schools in the 1950s. Indeed, significant changes took place from the 1930s through mid 1950s. 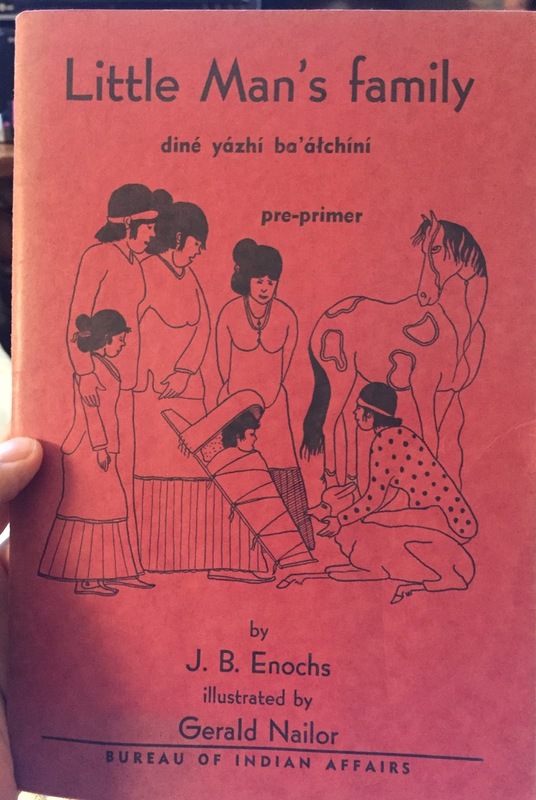 Under the direction of John Collier (appointed as Commissioner of Indian Affairs in 1933 by President Roosevelt), there was a shift to make the curriculum reflect Native life and instill pride in a Native identity. In My Mother's House by Ann Nolan Clark, illustrated by Velino Herrera, is one of the outcomes of that shift. 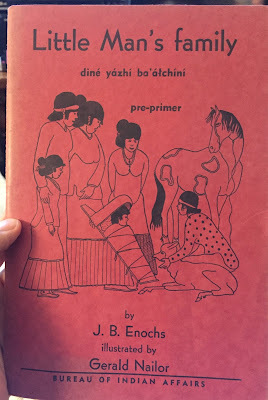 With various Native illustrators, Clark wrote several books like In My Mother's House between 1940 and 1951. Some of them were published in a Native language. Here's the cover of Little Man's Family, published in 1953. See the words beneath the English title? That is Dine (Navajo). It appears on every page. It seems unlikely then, that there would be "English Only" posters on the walls of the school. On page 112 of Stealing Indians, Simon and another boy speak Navajo to each other. Their conversation is overheard and Simon ends up being locked in an old maintenance building. It is a dramatic scene. Simon is led to the back of the poorly lit room where he's handcuffed to a pipe and left to sit on the concrete floor for several days. That scene sounds a lot like what happened in the schools in earlier times. In particular, it reminds me of a scene from a documentary about Carlisle Indian Industrial School. Again, though, it doesn't ring true for the 1950s. There are other plot points that I also find problematic. I think I'll stop here, saying again, I do not recommend Stealing Indians. It has problems of stereotyping, lack of tribal specificity, and problems with accuracy with respect to boarding schools of the time period in which the story is set. Given the depth and breadth of inaccurate depictions of Native people--past and present--in textbooks, movies, TV shows, and children's books, I firmly believe that the experiences Native people lived through must be presented with integrity and accuracy. Over-dramatizing what happened is a disservice to their experiences. Each year, the James Jones Literary Society selects a recipient for its James Jones First Novel Fellowship Award. In 2004, Smelcer received the award for The Trap. Last year, Kaylie Jones wrote to me about Smelcer. She had questions about him and was glad to find that others did, too. James Jones was her father. "We took him off the website because he's an embarrassment to us." "He was fired from Wilkes University MFA program because he flat out lied about having a PhD from Oxford." "The Norman Mailer quote is absolutely false. All the writers whose quotes he has there are deceased. So how can we prove it? Mailer's biographer J Michael Lennon says it is absolutely false and that I can prove." Debbie--have you seen BELLA BELLA by Jonathan London? From best-selling author Jonathan London comes BELLA BELLA, the heart-pounding sequel to DESOLATION CANYON. In this story for young readers, the same cast of characters―thirteen-year-olds Aaron and Lisa and their fathers, and seventeen-year-old Cassidy and his dad―embark on a sea kayaking trip through the Inside Passage that brings them unexpected and even terrifying adventures. Young readers will eagerly follow Aaron’s adventures in this suspenseful page turner, as he learns to navigate a kayak, discovers another side to a bully, shares a first kiss, encounters the desperate world of human trafficking, and challenges an evil smuggler who threatens the entire group. Nothing in the synopsis to tell you there's Native content, but the art on the top half of the cover tells us there is (see image to the right). I don't know what to call that image. Is it meant to be a totem pole? What do you think it is? 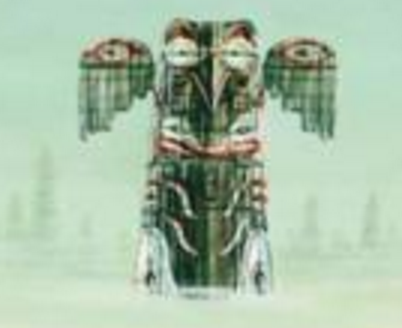 The review at Kirkus tells us that the characters begin their trip at a First Nations village (Bella Bella) and that they hope to learn about First Nations tribes. The Kirkus review included a link to their review of Desolation Canyon, so I took a look at that review. It apparently has Native content, too. If I get a copy, I'll be back with a review. If you've got a copy, please comment on what you see in it.